Manual Load, Island of Automation, or In-Line: What is the Right Solution for my Process? Often customers are wrestling with the question of which option makes more sense in their given business environment: a manual system, independent automated work cells, or an entire line of automation? There are many factors to consider, but one of the most common is your throughput requirement. Palomar Technologies is the exception in our market in that we can offer total solutions to our microelectronics assembly customers. We offer manual load, “islands of automation”, and full in-line solutions—not only for our own equipment, but also through alliances and partnerships with other companies that allow us to integrate and provide the entire automated line. Let’s look at the original question a little closer. Let’s start by assuming we have either one product, or multiple products with similar characteristics, such as size, number of components, and processes. On the surface this can look like the easiest calculation. I need X amount of parts per year and the equipment will cost X amount of dollars. However, there are still a few questions that need to be asked: What is the balance of the processes? Or another way of putting it: where are my bottlenecks? If you are putting one die down using epoxy but you have 300 wire bonds, this will mean the output of the entire line will be dictated by the wire bonder. In this case, you may need multiple wire bond systems to “balance” the line and achieve the throughput. If the annual throughput is within the capability of a single wire bonder, then it might still make sense to go in-line. You would have excess capacity on the die bonder, but this will enable you to expand capability in the future by just adding wire bonders. Sometimes when there are large discrepancies in the balancing of the line, it might make more sense to go with Islands of automation. For example, the epoxy/die bonder has its own in/out mags and does that part of the process. The carriers/boats are transferred manually to the downstream processes. Overall you will be looking for these work cells to be able to able to produce at about the same rates. It may make sense to have more than one piece of equipment in a cell, or island of automation. For example, a plasma cleaner in-line with a wire bonder, or a ball and wedge bonder in-line with each other. Another question in regards to throughput is: “Can I fully remove the need for human intervention?” Sometimes there is something in the process that just hasn’t been automated. This can be the requirement for a visual inspection by an operator. It could be the manual reference of a part or the “tweaking” with tweezers of a certain component. Again, this is where Palomar has many tools and flexibility in our systems in order to solve these issues and achieve the fully automated solution. 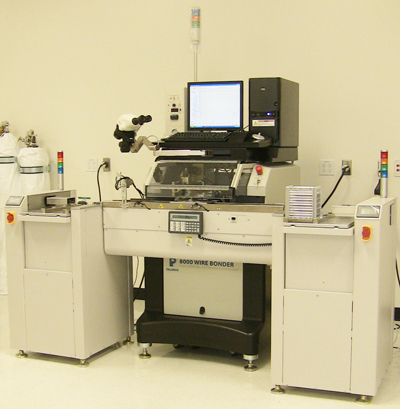 Recently, we introduced VisionPilot® with Radar Referencing® to both our die and wire bonders. We saw it as a valuable tool to totally eliminate the need for operator Interface to “find” components that lack distinct features such as Moly Tabs, Chip Resistors, and Pins. In short, there are many tools in the Palomar suite of automatic solutions that are designed for compensation and variances to the process that an operator was previously addressing. Whether you are looking for a manual presentation, an island of automation, or a fully in-line solution, Palomar has the tools, systems, and most importantly, the knowledge and experience to tackle them all.